The Battle of Gettysburg is considered the turning point of the American Civil War. It involved three bloody days of fighting in extremely hot weather in and around the small town of Gettysburg Pennsylvania. On this page we will list many interesting facts about the Battle of Gettysburg including information on the dates of the battle, who the generals and other leaders were, what caused the battle, and how the battle affected the War Between the States. Click here for a great selection of Amazon.com books about the Battle of Gettysburg. The battle was fought from July 1st through July 3rd 1863 in and around the town of Gettysburg Pennsylvania. The Union army was led by General George Gordon Meade and the Confederate army was commanded by the legendary Robert E. Lee. Meade had just three days prior been given command of the Union army. The battle started when Confederate soldiers entering Gettysburg, in search of shoes and other supplies, spotted Union soldiers arriving in the town. The Confederates would slip away but returned on July 1st with a substantial force to confront the enemy. The Confederates, wanting a major victory on Northern soil, launched the main attacks of the battle. The Union forces formed defensive lines. Although the battle put the men, women, and kids of Gettysburg in great danger only one civilian was killed; her name was Jennie Wade. The first day of the battle saw Union forces northwest of the town being overwhelmed by Confederate forces. The southerners forced the Union soldiers into a frantic retreat through the town of Gettysburg to defensive positions on hills south of Gettysburg which included Cemetery Hill. The Unions ability to gain this high ground and the fact that the southerners did not attack those positions on the first day were important events that contributed to the Union winning the battle two days later. The second day of the battle saw horrific fighting as the Confederates attacked the Union left flank. Battlefield locations such as the Wheatfield, the Peach Orchard, Devil's Den, and Little Round Top would become famous for the bloody fighting that took place there. The Union right flank on Culp's Hill and Cemetery Hill was also attacked. The Union lines, despite experience heavy casualties held their positions against the determined Confederate forces. The third and final day of the battle saw continued fighting on Culp's Hill along with cavalry battles on the outskirts of Gettysburg. After an unprecedented exchange of artillery fire by both sides the battle was decided by a huge Confederate attack on the center of the Union line. This attack has been dubbed Pickett's Charge named for the General who led it. Pickett's Charge involved over 12,000 Confederate soldiers leaving their positions on Seminary Ridge and crossing a wide open field to attack the center of the Union line. They faced heavy Union artillery fire and as they got closer to Cemetery Ridge unrelenting Union rifle and canister shot. The brave Confederate soldiers broke through the Union lines at a place called the angle but were pushed back. This ended the battle with a Union victory. 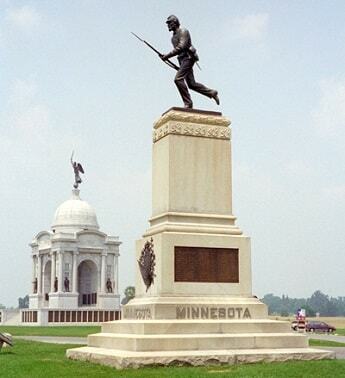 The battle would result in the largest number of casualties of any battle in the American Civil War. The Battle of Gettysburg is considered the turning point of the American Civil War; stopping the Confederates invasion of the North. General Meade failed to pursue the retreating Southerners allowing them to withdraw from the battlefield and to carry on the war for another two bloody years. General Lee had hoped a decisive victory on Northern soil would encourage European powers to join the Confederate War effort. The loss of this battle eliminated that chance.